“Lordy, would you take a look at those monsters,” drawled Gary in a thick Australian accent. He stood in front of Egypt’s Pyramids of Giza in awe. “There is no way on earth those were built by human hands.” He then squinted into the sun, lifted a weathered hand to his brow and searched the midday skies. Gary made observations like this often in the two weeks we travelled together. At night he drank too much Bundaberg rum – either neat or with Pepsi – and tried to account for his existence. During the day his eyes combed the landscape, the temples and the tombs for evidence to support his theory: Gary believed, with every inch of his being, that the earth had been colonised by aliens. 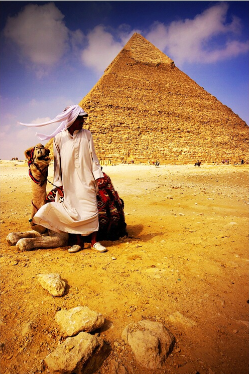 A visit to Egypt had been his dream ever since he was 15; now at 62, he said, this trip was his pilgrimage. When you’re on assignment for a publication, you can’t always choose your travel companions. More often than not, you find yourself living a week or two alone, or in very close quarters with a motley bunch of people you’d likely never have crossed paths with were you on the road with a mate. But that’s the beauty of travelling solo – and I’m convinced your experience is that much richer for it. And if not, then at least you have an entertaining hook for your story. For me, Gary – a sometimes annoying man who was on the journey of a lifetime – was that person. He drove me insane; he told me stories; he made me laugh. He probably forgot about me the moment he climbed onto that plane headed for Brisbane. But he worked his way into my memories of Egypt, and into the stories I’ve written. I’ve not forgotten him. And every time I look at the stars, or see a photograph of Egypt, or hear anyone at a bar order a rum, I wonder if Gary ever found what he was looking for. Read more about Gary, and about Egypt, in the full feature on the Getaway website, here. “Lordy, would you take a look at those monsters,” weird, that is EXACTLY what I said when I first saw Swedes – savages I tells ya, savages. I tried to click through to the article but it looks like the link is wrong.